As an Island Batik Ambassador, I have been provided with some of the items mentioned in this post, including Island Batik fabric, Aurifil Thread, Hobbs Batting, and Accuquilt Go! Welcome back! It's been a little bit, but I've been super busy with life stuff like applying for a job, interviewing for a job, getting an offer for that job, and then finally starting that job! Whew! It's been crazy, but I think I'm finally catching up, and I have a fun quilt to share with you! When I learned that the March challenge for the Island Batik Ambassadors was Vintage Reimagined, I knew exactly what to do --- pull out ALL the vintage quilts in the house for some inspiration! I'll share the story of these quilts and some close-up shots in another blog post. In short, they were part of the package when we purchased our very first home in 1989. While I didn't know the maker of these quilts personally, I did know that we were now responsible for taking on the "job" of using these quilts just as they were meant to be used -- to provide warmth and love. I got out the Accuquilt Go! 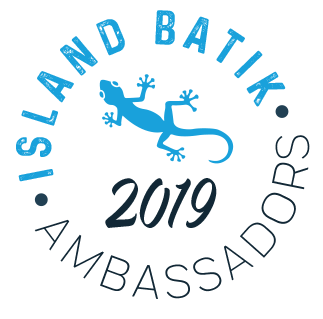 (one of the many awesome benefits of being an Island Batik Ambassador!) and started cutting the pieces needed. This is just a small set of the pieces I cut, and it all went so fast!! I used the 4.5" die, the 5" die, and the 2.5" x 4"5 die. Super fast! 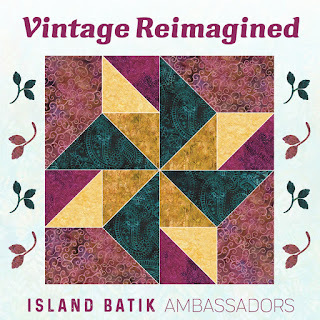 I used the Island Batik white solid, several of the 5 x WOF strips in shades of blue, as well as the 2.5" red strips of text fabric in the Soul Song collection. Some of the blues - the rain drops and the trees - were perfect to represent the Pacific Northwest, where I've lived for the past 26 years. I used Hobbs 80/20 bleached batting and Aurifil 40 wt thread, #2024 for quilting. My dude (aka quilt holder) and I walked around downtown to find just the right spot for taking a good pic, and I think this is the perfect one! Our downtown has some spectacular murals! I opted for a fun binding technique - matched binding. I used this on my dude's birthday quilt a few years ago. 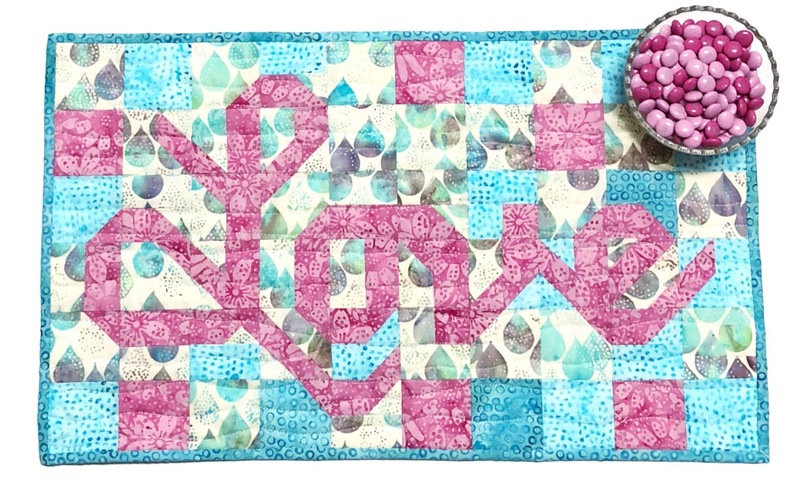 You can find a tutorial from A Quilter's Table here. 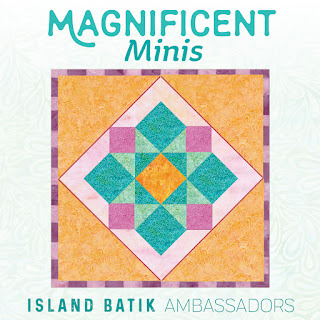 Who doesn't love a quick mini quilt? 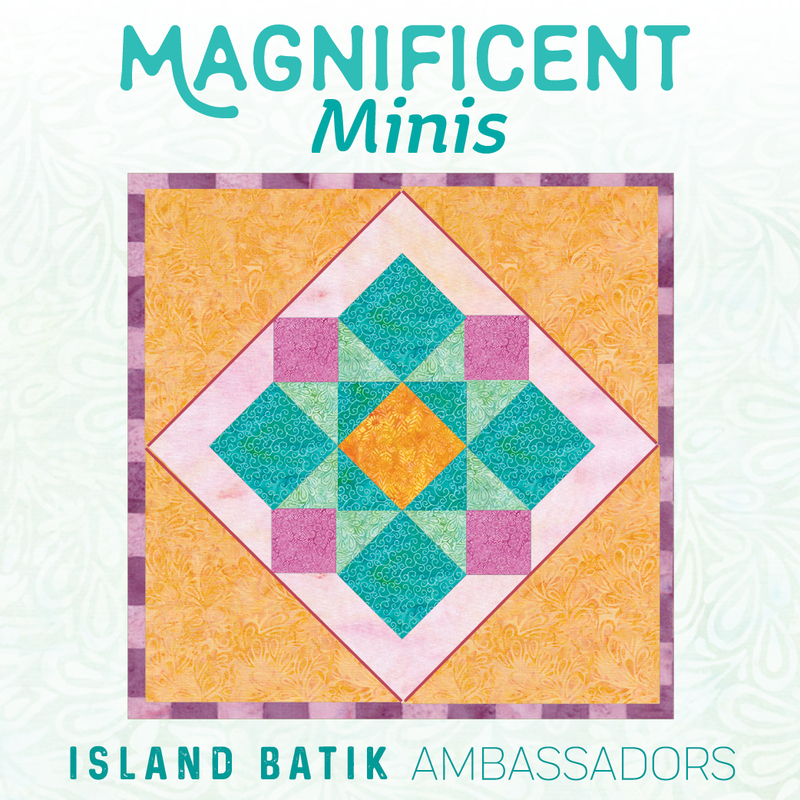 When I saw that my first challenge as an Island Batik Ambassador was to make a "Magnificent Mini" quilt for February, I knew exactly which one I was going to make! The LOVE quilt in the Keeping Cursive Alive mini series by Kelli Fannin Quilts. Check out these tiny triangles left over from trimming! They measure 3/4" from base to point! I'm trying to decide what I'm going to do with these. I just can't throw them away!! I used Hobbs 80/20 batting and Aurifil 50 wt. thread, #2026 which is pretty much my go-to color for piecing. I used my walking foot to quilt wavy lines. Easy peasy! Since this is a mini quilt, it didn't take long at all! For my mini quilts, I don't use a double fold binding like I do with larger quilts that will get a lot of use. I just cut strips 1.5" wide and the length that I need, then machine stitch them to the front, then flip over and handstitch it to the back. Again, super easy because it's just a mini! If you're ever in a funk and need to sew a little something to bring you out of it, try making a mini, even if it's just a mug rug, and I guarantee you'll feel better! I'm doing my best to finish up projects that I started years ago, but new projects just keep popping up! 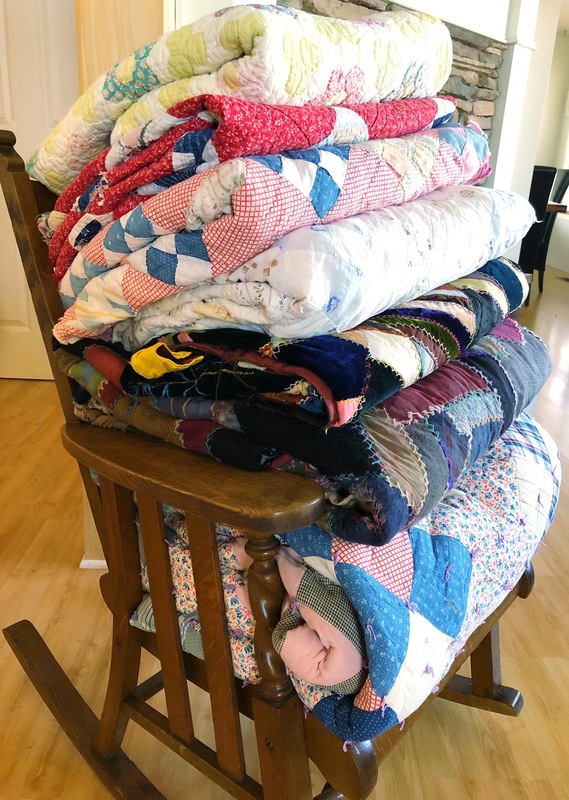 I'm sure if you're a quilter reading this blog, you know exactly what I'm talking about! I finally got this quilt top finished recently. It's not quilted yet, but I'm okay with that. After about two years, I finally started removing the threads 1/4" on every single hexie. Every. Single. One. And then I was done. I put them all back in their container and shoved it back on the shelf. Fast forward to 2019, when I was finally in the mood to finish it! And then I attempted a Y seam, and said NOPE! I figured it would take me six months to do it, and I wanted it done now! I'm not afraid of Y seams, but I didn't want to spend that kind of time for this particular quilt. So I got out the Hex n' More ruler again and decided to do half hexies. I didn't want to waste too much of this beautiful fabric (Bijoux by Bari J) by using the next size down marked on the ruler, so I decided to make my own template. NOTE TO SELF: Measure twice (or more! ), cut once!! They're really, really close to hexies. Close enough for me anyway. Or, as my father-in-law used to say....."good enough for who it's for."